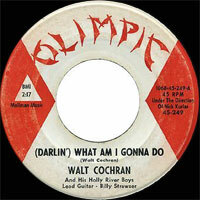 Chanteur Country US, Walt Cochran a enregistré chez Olimpic et Holly Records. 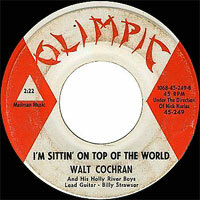 US Country singer, Walt Cochran recorded at Olimpic and Holly Records. 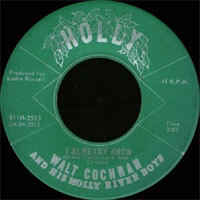 1965 SP HOLLY 811H-4671 (US) Walt COCHRAN & His HOLLY RIVER BOYS - I'm Sittin' On Top Of The World / ( Darlin') What Am I Gonna Do ? 196? 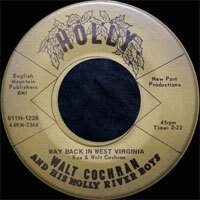 SP HOLLY 811H-2886 (US) Walt COCHRAN & His HOLLY RIVER BOYS - Six Days On The Road / ?